Pride of Hong Kong Marco Fu was through to Last 32 of Haikou World Open with a highlight of making a maximum break . Hong Kong cueman made his second maximum break on his way to beat Matthew Selt by 5-2. 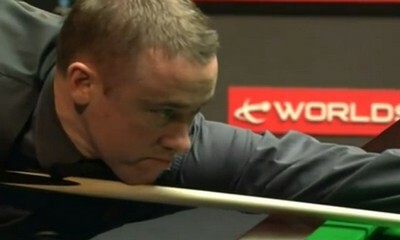 His 147 came in the sixth frame when Matthew Selt left him a fair chance eventually turned out to be a maximum break. The tenth black he played was awesome. This is Fu's second maximum break after 2000 Scottish Masters against Ken Doherty (147 was the only frame he won). Congratulations to Marco! Meanwhile, 23-year-old Sam Baird is qualified for ranking event for the first time - His opponent World Number 17 Mark Davis went 3-1 up with 137 but Baird made 75, 68, 63 and 55 to win 5-4. Impressive victory for Robert Milkins as he whitewashed Ryan Day to qualify another China ranking tournament. Marcus Campbell saw off Alfie Burden 5-3 from 0-3 down to win five frames in a row. Stephen Hendry continued his great form after reaching the semi-finals of PTC12 last week, defeating Mike Dunn with scoreline of 5-2. Two Chinese boys Liang Wenbo and Yu Delu fell in the final round of qualifying as they lost to Mark King and Andrew Higginson respectively. Jamie Cope, Barry Hawkins, Dominic Dale, Tom Ford, Jimmy Robertson, Ricky Walden, Joe Perry, Michael Holt and Nigel Bond are the remaining winner today to qualify for Haikou World Open which runs from February 27 to March 4.